The government has banned "all types of vending be banned with immediate effect", cabinet ministers revealed Monday as the country battles a cholera epidemic that has claimed 30 lives nationwide. "As a way of improving the general sanitation in the city (of Harare) it has become imperative that all types of vending be banned with immediate effect," said local government minister July Moyo in a statement. "At this juncture, we would like the vending public to paying heed to government measures. I urge all vendors who are playing hide and seek with the law enforcement agents to comply." He added; "I am aware that there are some vendors who were operating with permits from the City of Harare. "I direct that the law enforcement agents should amicably dismantle the stalls they are operating from." Women's Affairs, Gender and Community Development Minister Sthembiso Nyoni also reiterated the message during a meeting with vendor associations in the capital on Monday. "Let me be blunt we are no longer going to have vending anywhere and everywhere," she said. The death toll from the cholera outbreak reached 31 on Monday with more than 5,000 suspected cases reported around the country. Meanwhile, the vendors have vowed to resist government plans to force them off the streets saying they are not responsible for the epidemic. 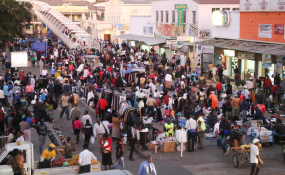 "Vendors are not the ones spreading cholera," said Arthur Muromba, chairman of the Zimbabwe Informal Traders Council. "(Harare) should consider renovating Mbare Musika, and have it checked regularly by health inspectors; council should employ inspectors to monitor the place every day." Meanwhile minister Moyo revealed that Treasury has set aside a further $500,000 for kick-starting clean-up campaigns which will initially be targeting selected Harare suburbs and the 23 cholera hotspots. The clean-up programme for Harare Metropolitan Province will be spearheaded by The Environmental Management Agency (EMA and start late December.